Beginning with the first pediatric heart surgery on the West Coast in the 1930s, our Heart Institute has a history of treating small hearts with big problems. Nearly a century later and under world-renowned leader Vaughn Starnes, MD, we are known for taking on the most complex cases and maintaining impressive health outcomes. We boast an integrated inpatient and outpatient suite of services that combines experts in cardiology, cardiothoracic surgery, cardiothoracic transplant, cardiothoracic intensive care and cardiovascular acute care on a single floor in a state-of-the-art healing environment. With fewer steps for families to navigate, our patients receive care that is more streamlined and less stressful. We treat from fetus to adulthood and serve as a major tertiary referral center for all congenital heart defects. The Division of Cardiology cares for children with heart or blood vessel problems that may not require surgery. We are a recognized leader in state-of-the-art evaluation, diagnosis and treatment for all forms of heart disease. The division offers expertise in all major areas of cardiology, with nationally-recognized subspecialists. 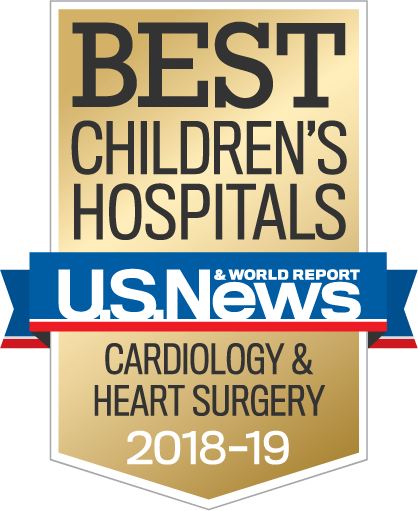 The surgeons on our team are known for their innovative pediatric cardiothoracic surgical techniques, some of which were pioneered at our hospital, and are now used across the nation to improve the lives of children with heart and lung defects. Our unit is the first and oldest of its kind on the West Coast. It is also the most advanced. Well over half of our patients are newborns with congenital heart conditions; we continue to push forward with the most innovative treatments including extracorporeal membrane oxygenation (ECMO) and ventricular assist services. We are the only pediatric CTICU in the western United States to have received the prestigious Gold Beacon Award for Excellence from the American Association of Critical-Care Nurses. This unit is designed for family-centered care. Ninety percent of our patient rooms are private and built to accommodate parents who wish to stay overnight with their child during recovery from life-threatening cardiac conditions. Our two state-of-the-art laboratories leverage the latest technology to provide clear and accurate cardiac data for our physicians while reducing the radiation required for successful pediatric procedures. We perform interventions across the spectrum of congenital heart disease, such as valvuloplasty, angioplasty and fetal interventions, using devices tailored for pediatric patients, including stents, occluders and transcatheter valves. Our ambulatory clinic is located on-site, creating a sense of Familiarity for patients and their Families if an inpatient visit for a catheterization or surgery becomes necessary. Perform pediatric heart surgery on the West Coast. Pioneer pediatric open heart surgery in Southern California. Perform a successful surgical treatment for transposition of arteries on the West Coast. Accomplish a double-lung lobe transplant from living parents to a child with cystic fibrosis in the world. Create the first pediatric cardiothoracic intensive care unit on the West Coast.